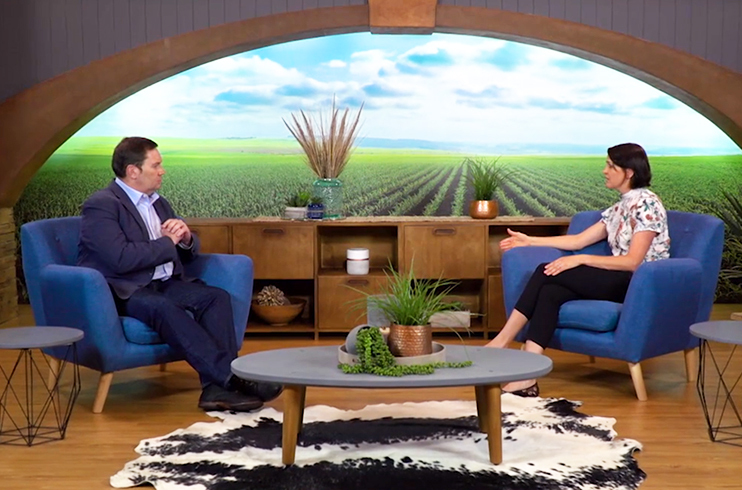 South African raisins are among the best in the world and have earned a spot in the second episode of the new Nation in Conversation series where presenters, Theo Vorster and Rozanne McKenzie take us to Upington in the Northern Cape. Vanessa van Wyk, Manager: Economic Development and Tourism takes the viewer through the history of the town letting us in on the origins of how Upington came to be. We find out exactly why this part of the Kalahari is known as “The Green Kalahari". The river is not only a source of water but also extremely important for the agricultural and tourism industry here. We visit the Kalahari Orange Museum where Assessor at the Tourism Grading Board, Enrico Mapanka, talks to us about the donkey and how it was cardinal in Upington's growth. He also takes us through the numerous tourist attractions in the small town, such as the camel police station, Upington 26 with the Augrabies Waterfalls.We also take a look at the Tanien Crocodile Farm and we meet owner Rooies Strauss. The program visits Carpe Diem Group's organic raisin paradise where Managing Director, Gog van der Colff, tells us about the growth potential and profitability of the raisin market. They not only produce raisins but also grapes and pecan nuts. All their products are certified organic offer tremendous market access. Due to the high quality of their product, they export 95% of their products and also supply to Woolworths, Cadbury's and Chipkins. Did you know that 90% of raisins in South Africa come from the Lower Orange River area and that four tons of grapes are needed to produce 1 ton of raisins? Well you learn something new every day. So when you bake, eat cereal or eat chocolate, think about the enormous potential of raisins. With the latest consumer drive to move towards healthier living nowadays, raisins are definitely the snack of choice. Rozanne finds out where the real value of raisins lies by talking to Ferdie Botha, General Manager of Raisins South Africa. He mentions that the selling point of raisins are that it is a natural product and has no preservatives. In addition, it is a non-perishable product and also very healthy as well. Talking about markets. Theo Vorster and Lindie Stroebel of the Produce Marketing Association (PMA) tackle markets and mention that Europe comprises 53% of the consumer market and the United Kingdom about 25%. In contrast, only 1% in Asia. There is certainly potential for expansion, especially in Asia, but there is a lot of hard work where the right specifications and cultivars for this market have to be produced. Coming up in episode three, we explore the onion industry and the village of Barkly West comes into focus as we chat to Louis de Kock of Wildeklawer, the largest onion producer in the country. To catch the program's repeat, check in at kykNET, Fridays at 13:00, Saturdays at 17:30, Sundays at 17:00, Tuesdays at 16:30 and Wednesdays at 14:00. And don't miss the next 11 weeks of the 13-week series where we tackle onions, livestock, nurseries, forestry, beetroot, Nampo Harvest Day, wheat, cotton, pecan nuts and citrus. It is broadcast weekly, every Thursday evening at 18:00 on kykNET, from now until 27 June 2019. For more information or the complete schedule of this new series please visit the website www.nationinconversation.co.za.